A kaleidoscopic, fast-paced tour of Latin America from one of the Spanish-speaking world’s most outstanding writers. Lamenting not having more time to get to know each of the nineteen countries he visits after winning the prestigious Premio Alfaguara, Andrés Neuman begins to suspect that world travel consists mostly of “not seeing.” But then he realizes that the fleeting nature of his trip provides him with a unique opportunity: touring and comparing every country of Latin America in a single stroke. Neuman writes on the move, generating a kinetic work that is at once puckish and poetic, aphoristic and brimming with curiosity. Even so-called non-places—airports, hotels, taxis—are turned into powerful symbols full of meaning. A dual Argentine-Spanish citizen, he incisively explores cultural identity and nationality, immigration and globalization, history and language, and turbulent current events. Above all, Neuman investigates the artistic lifeblood of Latin America, tackling with gusto not only literary heavyweights such as Bolaño, Vargas Llosa, Lorca, and Galeano, but also an emerging generation of authors and filmmakers whose impact is now making ripples worldwide. 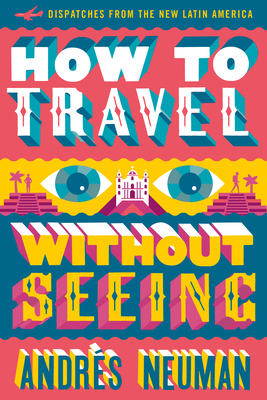 Eye-opening and charmingly offbeat, How to Travel without Seeing: Dispatches from the New Latin America is essential reading for anyone interested in the past, present, and future of the Americas. Andrés Neuman was born in 1977 in Buenos Aires, Argentina, and grew up in Spain. He was selected as one of Granta's Best of Young Spanish-Language Novelists and was elected to the Bogotá39 list. Traveler of the Century (FSG, 2012) was the winner of the Alfaguara Prize and the National Critics Prize, Spain's two most prestigious literary awards, as well as of a special commendation from the jury of the Independent Foreign Fiction Prize. Neuman has taught Latin American literature at the University of Granada. Jeffrey Lawrence received his PhD in Comparative Literature from Princeton University and is currently a professor of English at Rutgers University. “For his novel, Traveler of the Century (2009), Neuman received the prestigious Premio Alfaguara, awarded to outstanding works of Spanish-language literature. The prize includes a public-speaking tour, and Neuman took the opportunity to compose a travelogue that is anything but ordinary, combining wry observations, deadpan aphorisms, and literary commentary. From Asuncio´n to Panama, Neuman bounces all over South and Central America, recording amusing moments... and cataloging the writers he reads along the way, including Borges and Bolan~o but also lesser-known, contemporary upstarts, like Pola Oloixarac, Mo´nica Vela´squez, and Daniel Alarco´n . . . The hopscotch narrative, unique insights, and unapologetic bibliophilia make this book perfect for travelers as well as readers bound to home for the time being, looking for an escape."